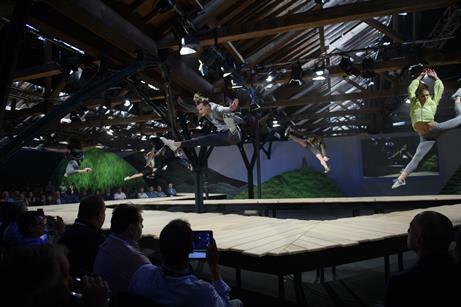 Agency TBA organised the Clarks Spring Summer 2016 global sales launch at the Tobacco Dock, London, which took place in June this year. 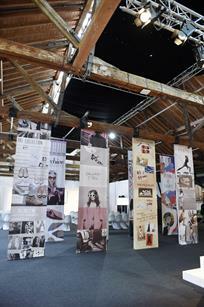 Clarks hosts two global sales launches every year, to showcase its latest designs to 300 of its sales staff. The events are organised by the company’s Go to Market team, with the support of agency TBA. 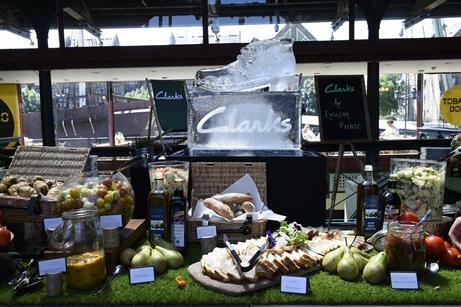 "The aim of these events is to inspire, inform and excite our employees about the new seasonal range, so that they can sell more effectively to our key accounts and customers," explains Lucy Hagen, group conference and events manager at Clarks. "During these events we share the vision for the brand, as well as the key products and objectives for the season." Clarks went out to tender for the summer 2015 event in June the previous year, inviting a number of agencies to pitch for the work. After a lengthy pitch process, TBA was appointed, due to the creativity displayed throughout the process. "They really understood what we wanted to do as a brand. We just gelled with them as an agency. The format of the event needed to include a big plenary, a fashion show and product presentations. The delegates were from several markets, including Americas, Asia Pacific, Europe and the UK & ROI. 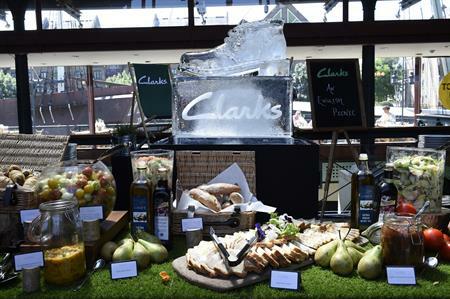 Tobacco Dock in London had been successful for previous events, so Clarks decided to return for their Spring Summer 2016 launch. "We needed a ‘blank canvas’ venue with a space we could make our own. The venue itself is a great fit with our brand, with lots of heritage and a modernised, fresh event space. "We usually have US delegates but on this occasion we had around a third of our audience from Asia Pacific, a third from Europe and a third from the UK. We always have people from across the world, and it’s a challenge to meet lots of different requirements," explains Hagen. Both Clarks and TBA had to ensure everyone was in the right place at the right time, whilst ensuring that presenters delivered high-quality, engaging content within their allocated time slots. The change round of rooms for different presentations was also a challenge, due to the number of shoes (3,000) that needed to be presented. Prior to the event, the agency ensured that the speakers were well-rehearsed. "A logistics team was kept on site to maintain smooth transitions between presentations, which meant delegates didn’t worry about where they were going, they just had to concentrate on the content and participating in their sessions," adds Max Fellows, senior relationship and business development director at TBA. According to Hagen, the event was one of the company’s ‘best ever’. "We were really pleased with the event. We issued a survey to all our attendees and the feedback was fantastic." She adds that the new challenge would be improving on the event for the future. "Of course we’re always trying to raise the bar as we want to keep it all fresh, we need to keep coming up with new and creative ideas." For Fellows, the look and feel of the event was key. "The flexibility of the venue space allowed for an indoor/outdoor feel. Being able to brand the entire venue not only gave Clarks ownership of the space, but gave us the opportunity to deliver a strong brand identity to inspire the guests. This is important given how passionate they are about the brand," he explains. For the agency, Clarks has developed into a valued account. "We now deliver their key events season on season with the next event being Autumn Winter Sales Launch", adds Fellows.